Although there are far less third party clients than there used to be, you still have several options, as shown below. 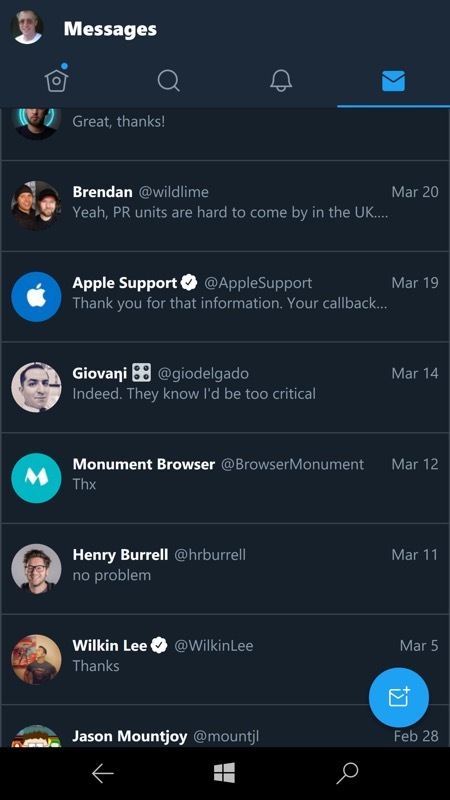 The biggest sticking point is likely to be support for DM (Direct Messages) - not everyone uses them, but some (including me) depend on them. 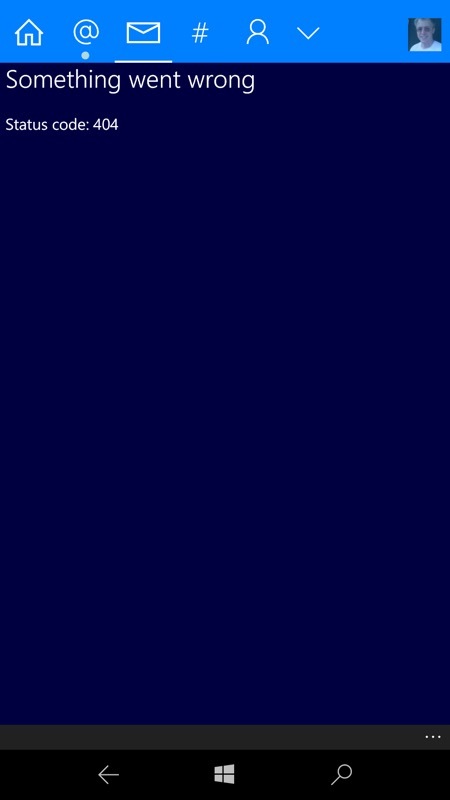 And it's annoying to have something urgent come in via DM and not know about it because I'm on Windows 10 Mobile and don't get notified in a prominent way. Yes, buried in Twitter's own settings (per account) is 'SMS notifications', but these only seem to work in selected countries (not including the UK) and I expect even this facility to be withdrawn in due course. Here are my suggested ways to access Twitter under Windows 10 Mobile, in any case, in 2019. Do get in touch if you can add an app or method! 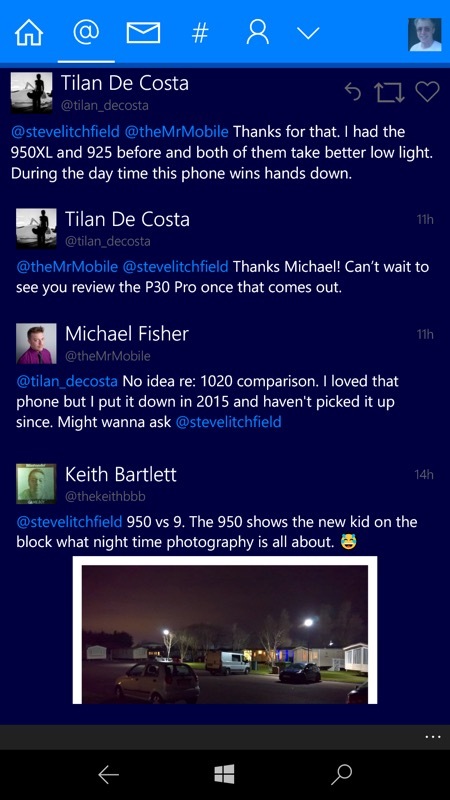 Yes, Tweetium UWP still works, despite Twitter's massive API change last summer. It's rather hamstrung though, in that there's no 'push' functionality, affecting both the timeline and (more critically) the DM system, which now shows a rather sad 'Something went wrong'. For general Twitter browsing and interaction, Tweetium is still phenomenally good. Just don't expect DM support now! 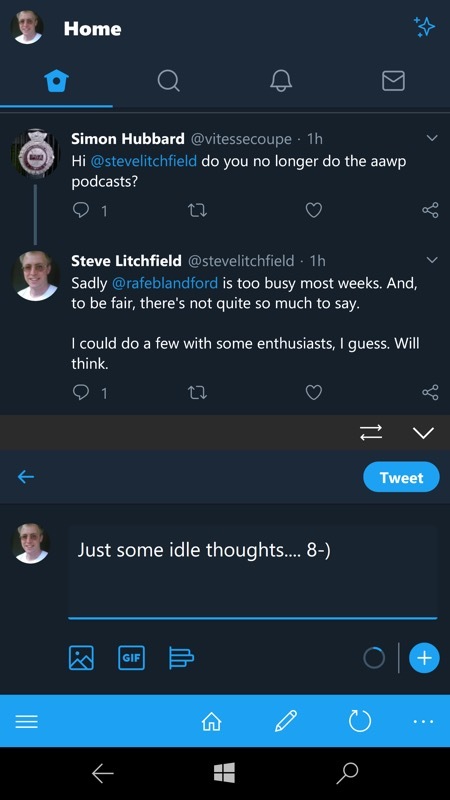 Still, if you ignore DMs and want Twitter more to see what's going on in the world and what people are saying about your latest updates (etc.) then Tweetium works surprisingly well. Your timeline is still auto-refreshed, it's just that it's not strictly real-time, it's on a one minute 'poll', etc. For most of us, that's absolutely fine though. This is a packaged PWA and essentially the same as if visiting mobile.twitter.com, though you do escape the Edge browser furniture. It's very useable and has the huge advantage that, being a first party solution, there's full support for whatever Twitter decides it wants to do or push. And DMs show up, of course, making this your best bet if Twitter DM is a form of messaging that you rely on, even if only for on-demand checking. Seemingly a custom web wrapper around the Twitter PWA, this adds a control for 'top' and 'bottom' of your timeline (the latter to the oldest loaded), a 'jump list' of searched terms, a pop-out 'new tweet' window, and an 'Unfollow non-followers' utility. Showing the pop-up (and toggle-able) Tweet window, plus the search-filled 'Jump list'. You do get all these, but at the cost of screen estate taken up by Raven's control bar and banner ads which require an IAP to remove. So it's your call as whether the few extras are worth it. Unsurprisingly, the Twitter API change also hit this in terms of DM access, but the rest still works and with a variety of interface colours and customisations. And still needs only kilobytes to work, not Megabytes, should you be in an area of limited bandwidth. 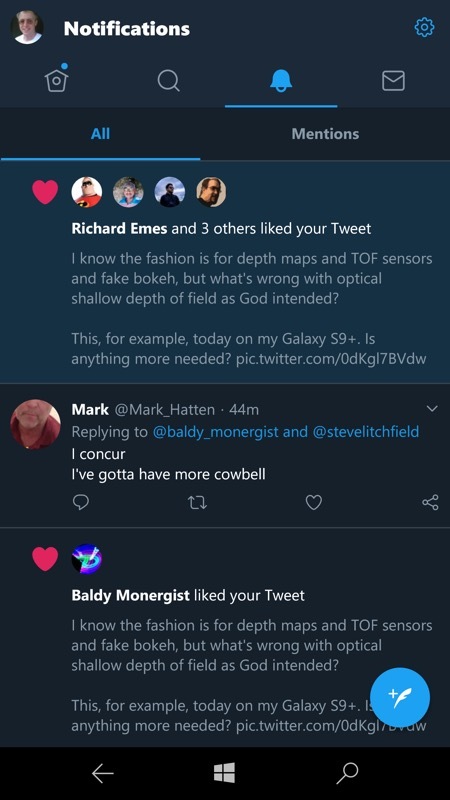 I do 'get' that Twitter is trying to get everyone onto their first party clients and interfaces for 'modern' OS, so Android and iOS are the only ones that get a proper Direct Message notification system. But since it's quite easy to 'scrape' a web interface these days, I'd love to see a Windows 10 UWP app (e.g. 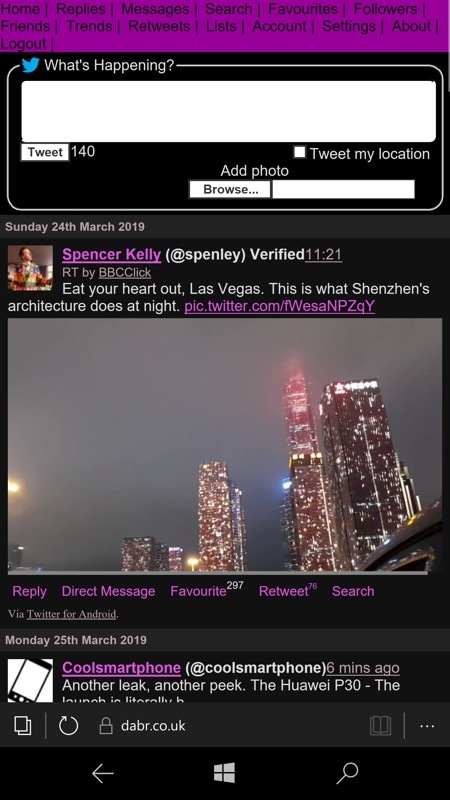 for Mobile) that scraped the DM system in Twitter's PWA interface in the background and presented the results, along with suitable notifications when new messages arrived. Now there's a challenge for a developer! 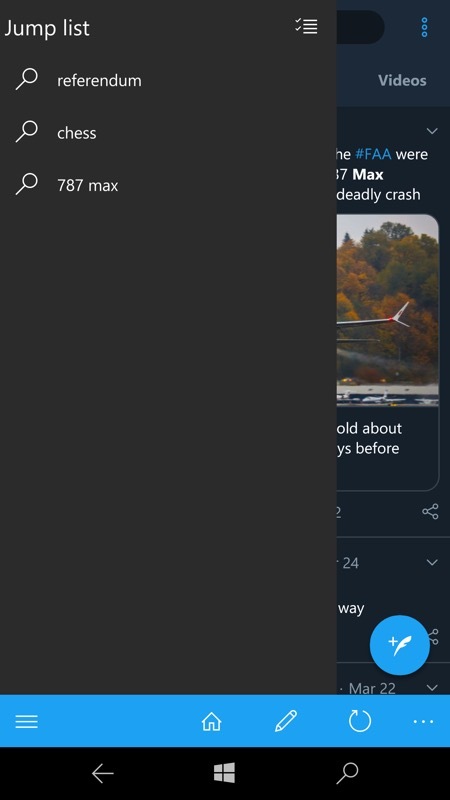 Filed: Home > Features > Twitter, as seen from Windows 10 Mobile in 2019!